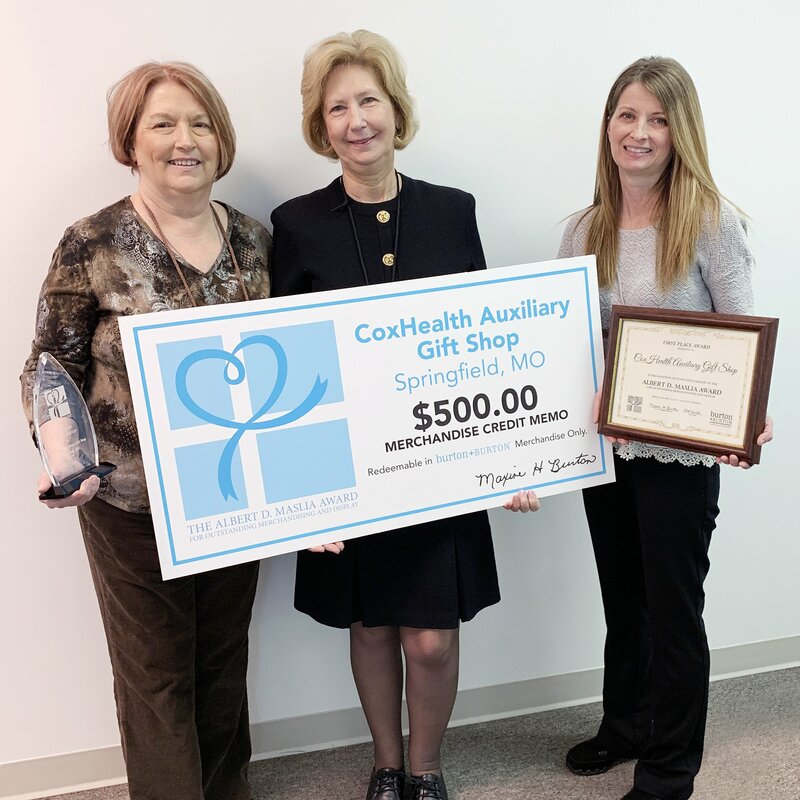 burton + BURTON recently announced Cox South’s Auxiliary Gift Shop as the winner of the Albert D. Maslia Award. The award was given by burton + BURTON in January 2019 at The Atlanta International Gift & Home Furnishings Market. The contest was open for all hospital gift shops to showcase their finest visual merchandising displays, and the winning entry was chosen by a panel of industry experts. The judges said Cox South’s Auxiliary Gift Shop’s creative use of space – throughout displays and windows – was cohesive in theme, and the detail given to every vignette set the shop apart. This is the second year in a row that Cox South’s gift shop has placed in the national contest. In 2018, the gift shop came in second. In addition to a $500 prize, a trophy and certificate were awarded to be displayed in the winner’s store. The award showcases excellence in visual merchandising for hospital gift shops and honors the memory of Albert Maslia, a member of the AmericasMart Atlanta management team. Mr. Maslia served as the Managing Director of Retail Services for AmericasMart and was a longtime friend of the hospital gift shop industry. Maslia passed away in April 2014.